Precision agriculture (PA), satellite farming or site specific crop management (SSCM) is a farming management concept based on observing, measuring and responding to inter and intra-field variability in crops. The goal of precision agriculture research is to define a decision support system (DSS) for whole farm management with the goal of optimizing returns on inputs while preserving resources. Among these many approaches is a phytogeomorphological approach which ties multi-year crop growth stability/characteristics to topological terrain attributes. The interest in the phytogeomorphological approach stems from the fact that the geomorphology component typically dictates the hydrology of the farm field. The practice of precision agriculture has been enabled by the advent of GPS and GNSS. The farmer's and/or researcher's ability to locate their precise position in a field allows for the creation of maps of the spatial variability of as many variables as can be measured (e.g. crop yield, terrain features/topography, organic matter content, moisture levels, nitrogen levels, pH, EC, Mg, K, and others). Similar data is collected by sensor arrays mounted on GPS-equipped combine harvesters. These arrays consist of real-time sensors that measure everything from chlorophyll levels to plant water status, along with multispectral imagery. This data is used in conjunction with satellite imagery by variable rate technology (VRT) including seeders, sprayers, etc. to optimally distribute resources. Precision agriculture has also been enabled by unmanned aerial vehicles like the DJI Phantom which are relatively inexpensive and can be operated by novice pilots. These agricultural drones can be equipped with hyperspectral or RGB cameras to capture many images of a field that can be processed using photogrammetric methods to create orthophotos and NDVI maps. Precision agriculture is a key component of the third wave of modern agricultural revolutions. The first agricultural revolution was the increase of mechanized agriculture, from 1900 to 1930. Each farmer produced enough food to feed about 26 people during this time. The 1990s prompted the Green Revolution with new methods of genetic modification, which led to each farmer feeding about 155 people. It is expected that by 2050, the global population will reach about 9.6 billion, and food production must effectively double from current levels in order to feed every mouth. With new technological advancements in the agricultural revolution of precision farming, each farmer will be able to feed 265 people on the same acreage. The first wave of the precision agricultural revolution will come in the forms of satellite and aerial imagery, weather prediction, variable rate fertilizer application, and crop health indicators. The second wave will aggregate the machine data for even more precise planting, topographical mapping, and soil data. economics: by boosting competitiveness through more efficient practices (e.g. improved management of fertilizer usage and other inputs). Prescriptive planting is a type of farming system that delivers data-driven planting advice that can determine variable planting rates to accommodate varying conditions across a single field, in order to maximize yield. It has been described as "Big Data on the farm." Monsanto, DuPont and others are launching this technology in the US. The field is delineated using an in-vehicle GPS receiver as the farmer drives a tractor around the field. The field is delineated on a basemap derived from aerial or satellite imagery. The base images must have the right level of resolution and geometric quality to ensure that geolocation is sufficiently accurate. Intra and inter-field variability may result from a number of factors. These include climatic conditions (hail, drought, rain, etc. ), soils (texture, depth, nitrogen levels), cropping practices (no-till farming), weeds and disease. Permanent indicators—chiefly soil indicators—provide farmers with information about the main environmental constants. Point indicators allow them to track a crop's status, i.e., to see whether diseases are developing, if the crop is suffering from water stress, nitrogen stress, or lodging, whether it has been damaged by ice and so on. This information may come from weather stations and other sensors (soil electrical resistivity, detection with the naked eye, satellite imagery, etc.). Soil resistivity measurements combined with soil analysis make it possible to measure moisture content. Soil resistivity is also a relatively simple and cheap measurement..
Predictive approach: based on analysis of static indicators (soil, resistivity, field history, etc.) during the crop cycle. sampling: weighing biomass, measuring leaf chlorophyll content, weighing fruit, etc. proxy-detection: in-vehicle sensors measure leaf status; this requires the farmer to drive around the entire field. 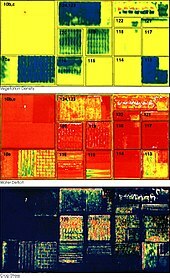 aerial or satellite remote sensing: multispectral imagery is acquired and processed to derive maps of crop biophysical parameters, including indicators of disease. Airborne instruments are able to measure the amount of plant cover and to distinguish between crops and weeds. Decisions may be based on decision-support models (crop simulation models and recommendation models), but in the final analysis it is up to the farmer to decide in terms of business value and impacts on the environment. It is important to realize why PA technology is or is not adopted, "for PA technology adoption to occur the farmer has to perceive the technology as useful and easy to use. It might be insufficient to have positive outside data on the economic benefits of PA technology as perceptions of farmers have to reflect these economic considerations." New information and communication technologies (NICT) make field-level crop management more operational and easier to achieve for farmers. Application of crop management decisions calls for agricultural equipment that supports variable-rate technology (VRT), for example varying seed density along with variable-rate application (VRA) of nitrogen and phytosanitary products. variable-rate farming equipment (seeder, spreader). The concept of precision agriculture first emerged in the United States in the early 1980s. In 1985, researchers at the University of Minnesota varied lime inputs in crop fields. It was also at this time that the practice of grid sampling appeared (applying a fixed grid of one sample per hectare). Towards the end of the 1980s, this technique was used to derive the first input recommendation maps for fertilizers and pH corrections. The use of yield sensors developed from new technologies, combined with the advent of GPS receivers, has been gaining ground ever since. Today, such systems cover several million hectares. In the American Midwest (US), it is associated not with sustainable agriculture but with mainstream farmers who are trying to maximize profits by spending money only in areas that require fertilizer. This practice allows the farmer to vary the rate of fertilizer across the field according to the need identified by GPS guided Grid or Zone Sampling. Fertilizer that would have been spread in areas that don't need it can be placed in areas that do, thereby optimizing its use. Around the world, precision agriculture developed at a varying pace. Precursor nations were the United States, Canada and Australia. In Europe, the United Kingdom was the first to go down this path, followed closely by France, where it first appeared in 1997-1998. In Latin America the leading country is Argentina, where it was introduced in the middle 1990s with the support of the National Agricultural Technology Institute. Brazil established a state-owned enterprise, Embrapa, to research and develop sustainable agriculture. The development of GPS and variable-rate spreading techniques helped to anchor precision farming management practices. Today, less than 10% of France's farmers are equipped with variable-rate systems. Uptake of GPS is more widespread, but this hasn't stopped them using precision agriculture services, which supplies field-level recommendation maps. One third of the global population still relies on agriculture for a living. Although more advanced precision farming technologies require large upfront investments, farmers in developing countries are benefitting from mobile technology. This service assists farmers with mobile payments and receipts to improve efficiencies. For example, 30,000 farmers in Tanzania use mobile phones for contracts, payments, loans, and business organization. The economic and environmental benefits of precision agriculture have also been confirmed in China, but China is lagging behind countries such as Europe and the United States because the Chinese agricultural system is characterized by small-scale family-run farms, which makes the adoption rate of precision agriculture lower than other countries. Therefore, China is trying to better introduce precision agriculture technology into its own country and reduce some risks, paving the way for China's technology to develop precision agriculture in the future. Precision agriculture, as the name implies, means application of precise and correct amount of inputs like water, fertilizer, pesticides etc. at the correct time to the crop for increasing its productivity and maximizing its yields. Precision agriculture management practices can significantly reduce the amount of nutrient and other crop inputs used while boosting yields. Farmers thus obtain a return on their investment by saving on water, pesticide, and fertilizer costs. The second, larger-scale benefit of targeting inputs concerns environmental impacts. Applying the right amount of chemicals in the right place and at the right time benefits crops, soils and groundwater, and thus the entire crop cycle. Consequently, precision agriculture has become a cornerstone of sustainable agriculture, since it respects crops, soils and farmers. Sustainable agriculture seeks to assure a continued supply of food within the ecological, economic and social limits required to sustain production in the long term. A 2013 article tried to show that precision agriculture can help farmers in developing countries like India. Precision agriculture reduces the pressure on agriculture for the environment by increasing the efficiency of machinery and putting it into use. For example, the use of remote management devices such as GPS reduces fuel consumption for agriculture, while variable rate application of nutrients or pesticides can potentially reduce the use of these inputs, thereby saving costs and reducing harmful runoff into the waterways. Precision agriculture is an application of breakthrough digital farming technologies. Over $4.6 billion has been invested in agriculture tech companies—sometimes called agtech. Self-steering tractors have existed for some time now, as John Deere equipment works like a plane on autopilot. The tractor does most of the work, with the farmer stepping in for emergencies. Technology is advancing towards driverless machinery programmed by GPS to spread fertilizer or plow land. Other innovations include a solar powered machine that identifies weeds and precisely kills them with a dose of herbicide or lasers. Agricultural robots, also known as AgBots, already exist, but advanced harvesting robots are being developed to identify ripe fruits, adjust to their shape and size, and carefully pluck them from branches. Advances in drone and satellite technology benefits precision farming because drones take high quality images, while satellites capture the bigger picture. 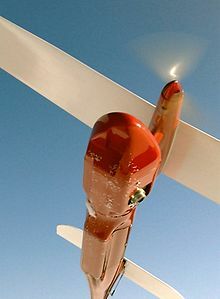 Light aircraft pilots can combine aerial photography with data from satellite records to predict future yields based on the current level of field biomass. Aggregated images can create contour maps to track where water flows, determine variable-rate seeding, and create yield maps of areas that were more or less productive. The Internet of things is the network of physical objects outfitted with electronics that enable data collection and aggregation. IoT comes into play with the development of sensors and farm-management software. For example, farmers can spectroscopically measure nitrogen, phosphorus, and potassium in liquid manure, which is notoriously inconsistent. They can then scan the ground to see where cows have already urinated and apply fertilizer to only the spots that need it. This cuts fertilizer use by up to 30%. Moisture sensors in the soil determine the best times to remotely water plants. The irrigation systems can be programmed to switch which side of tree trunk they water based on the plant's need and rainfall. Innovations are not just limited to plants—they can be used for the welfare of animals. Cattle can be outfitted with internal sensors to keep track of stomach acidity and digestive problems. External sensors track movement patterns to determine the cow's health and fitness, sense physical injuries, and identify the optimal times for breeding. All this data from sensors can be aggregated and analyzed to detect trends and patterns. As another example, monitoring technology can be used to make beekeeping more efficient. Honeybees are of significant economic value and provide a vital service to agriculture by pollinating a variety of crops. Monitoring of a honeybee colony's health via wireless temperature, humidity and CO2 sensors helps to improve the productivity of bees, and to read early warnings in the data that might threaten the very survival of an entire hive. ^ "Precision Farming : Image of the Day". earthobservatory.nasa.gov. 2001-01-30. Retrieved 2009-10-12. ^ McBratney, A., Whelan, B., Ancev, T., 2005. Future Directions of Precision Agriculture. Precision Agriculture, 6, 7-23. ^ Whelan, B.M., McBratney, A.B., 2003. Definition and Interpretation of potential management zones in Australia, In: Proceedings of the 11th Australian Agronomy Conference, Geelong, Victoria, Feb. 2-6 2003. ^ Reina, Giulio (2018). "A multi‑sensor robotic platform for ground mapping and estimation beyond the visible spectrum". Precision Agriculture: 29. doi:10.1007/s11119-018-9605-2. ^ Howard, J.A., Mitchell, C.W., 1985. Phytogeomorphology. Wiley. ^ Kaspar, T.C, Colvin, T.S., Jaynes, B., Karlen, D.L., James, D.E, Meek, D.W., 2003. Relationship between six years of corn yields and terrain attributes. Precision Agriculture, 4, 87-101. ^ Chris Anderson, "Agricultural Drones Relatively cheap drones with advanced sensors and imaging capabilities are giving farmers new ways to increase yields and reduce crop damage. ", MIT Technology Review, May/June, 2014. Retrieved December 21, 2016. ^ a b c d "Digital agriculture: Helping to feed a growing world". 2017-02-23. ^ Arama Kukutai (April 27, 2016). "Can Digital Farming Deliver on its Promise?". www.agnewscenter.com. ^ Bunge, Jacob (25 February 2014). "Big Data Comes to the Farm, Sowing Mistrust". Wall Street Journal. Retrieved 10 February 2015. ^ "Digital disruption on the farm". The Economist. 24 May 2014. Retrieved 10 February 2015. ^ "Precision Farming Tools: Soil Electrical Conductivity" (PDF). Retrieved Jun 12, 2016. ^ "PPaddy Field Zone Characterization using Apparent Electrical Conductivity for Rice Precision Farming". Retrieved Jun 12, 2016. ^ "New Waspmote Sensor Board enables extreme precision agriculture in vineyards and greenhouses- Libelium". www.libelium.com. ^ Mahlein, Anne-Katrin (2015-09-01). "Plant Disease Detection by Imaging Sensors – Parallels and Specific Demands for Precision Agriculture and Plant Phenotyping". Plant Disease. 100 (2): 241–251. doi:10.1094/PDIS-03-15-0340-FE. ISSN 0191-2917. ^ "The future of agriculture". The Economist. Retrieved 2016-06-12. ^ Aubert, Benoit (2012). "IT as enabler of sustainable farming: An empirical analysis of farmers' adoption decision of precision agriculture technology". Decision Support Systems. 54: 510–520. ^ Herring, David (2001-01-29). "Precision Farming : Feature Articles". earthobservatory.nasa.gov. Retrieved 2009-10-12. ^ "Simon Blackmore: Farming with robots". SPIE Newsroom. Retrieved 2 June 2016. ^ "precision agriculture with satellite imagery". Archived from the original on 2011-04-07. ^ a b "How Digital Is Solving Three Problems in Agriculture - TechnoServe - Business Solutions to Poverty". www.technoserve.org. ^ Kendall, H.; Naughton, P.; Clark, B.; Taylor, J.; Li, Z.; Zhao, C.; Yang, G.; Chen, J.; Frewer, L. J. (2017). "Precision Agriculture in China: Exploring Awareness, Understanding, Attitudes and Perceptions of Agricultural Experts and End-Users in China". Advances in Animal Biosciences. 8 (2): 703–707. doi:10.1017/S2040470017001066. ^ Pepitone, Julianne (3 August 2016). "Hacking the farm: How farmers use 'digital agriculture' to grow more crops". CNNMoney. ^ a b c d e f g "The future of agriculture". The Economist. ^ Anil K. Rajvanshi:"Is precision agriculture the solution to India's farming crisis"
^ Schieffer, J.; Dillon, C. (2015). "The economic and environmental impacts of precision agriculture and interactions with agro-environmental policy". Precision Agriculture. 16: 46–61. doi:10.1007/s11119-014-9382-5. ^ a b "Five technologies changing agriculture". 7 October 2016. ^ "Precision beekeeping with wireless temperature monitoring | IoT ONE". IoT ONE. Retrieved 2018-04-27. ^ Suporn Pongnumkul, Pimwadee Chaovalit, and Navaporn Surasvadi, “Applications of Smartphone-Based Sensors in Agriculture: A Systematic Review of Research,” Journal of Sensors, vol. 2015.